You may have heard that every Disney Cruise Line ship has a Pirate Night Deck Party, which is a nighttime show that’s pirate themed, which then ends with a fireworks at sea show! What’s fantastic about the Pirate night, is that it’s not just a show and fireworks, but Disney Cruise goes all out in making the whole day full of pirate festivities! Beginning in the Oceaneer’s Club and Oceaneer’s Lab (aka the kid’s clubs), they have pirate activities throughout the day. When my daughter went on our trip last week on the Disney Wonder, she got a pirate temporary tattoo and pirate facepaint, and even got to hang out with Captain Hook in the Oceaneer’s Lab! You can also get special pirate makeovers for girls and boys in Bibbidi Bobbidi Boutique, so whether you brought a pirate costume with you or not Disney’s got you covered (they also have costumes and accessories for kids in the stores on board). Also during the daytime turndown service, you’ll be left pirate bandanas to wear in the evening. At dinner time, the waiters are dressed in pirate garb! They have special menus for kids and adults. On the adult Pirates night menus, they have special alcoholic and non-alcoholic beverages that are Caribbean themed, and a special Caribbean sundae with special pirate white chocolate decoration on top. The kids menus are shaped like pirates hats, which actually can be worn as hats! We were fortunate to get to dine in Animator’s Palate on Disney Wonder during Pirate night – it was truly the best restaurant to have that evening! If you’re not familiar with Animator’s Palate on the Wonder, the restaurant is black and white, with sketches of Disney characters all around. On a typical evening, there are drawings on the walls from different Disney animated films that then transform into paintings and end with Sorcerer Mickey coming out to say hi as the paintings finish their transformation. On Pirate night, all the paintings on the wall were pirate themed (so from Peter Pan, Pirates of the Caribbean, Treasure Planet). At the end, the waiters gathered the kids dining and danced around the restaurant to “Yo Ho Yo Ho A Pirates Life For Me!”. Since Animator’s Palate was the restaurant we had twice on our cruise, it was extra special being able to experience it traditionally and pirate-themed! After dinner, we headed to the main deck to watch a pirate dance party with pirate Captain Mickey and the gang, where they had a dance off with Captain Hook and his crew! The show then ended with a grand fireworks finale! After that, they then offer a huge buffet in Cabanas after the show. Since we had just had dinner before the show, we headed back to our room and saw that instead of the traditional Ghiradelli chocolates on our bed, they placed chocolate pirate coins on our bed during the evening turndown service! 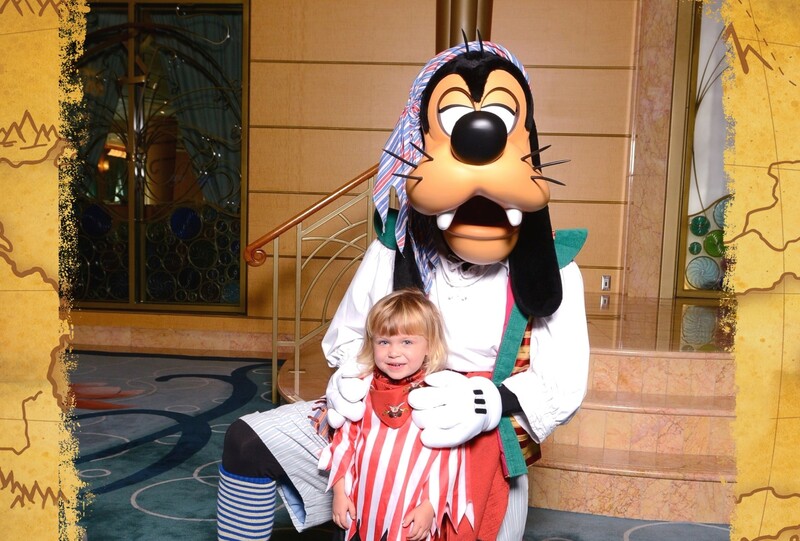 Pirate Night on Disney Cruise was definitely a highlight of our cruise, and my daughter’s favorite day of our trip!